FREE ADMISSION ON FIRST COME FIRST SERVE BASIS! This exciting preview includes a tour of the MIMOS R&D Centre @ Technology Park, Bukit Jalil where participants will get to see the labs, products and projects done by the R&D team of MIMOS Malaysia. Book your seats now and don’t miss this exciting field trip with iTrain! Abstract: In recent years, Internet of Things (IoT) has gained a lot of interest from both technology and business points of view. IoT is aimed at enabling the interconnection and integration of the physical world and the cyber space. It represents the trend of future networking, and leads the third wave of the IT industry revolution. 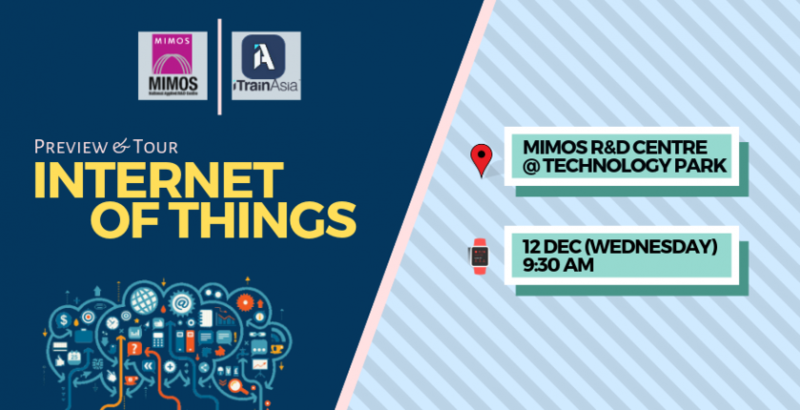 Abstract: The talk will discuss important components of Internet of Things, namely sensors, network and platform. Sensors could be deployed for various different applications. These sensors are inter-connected which facilitates data transfer from end node to IoT platform. Several examples and benefits will be highlighted followed an outline for successful implementation, deployment and adoption of IoT. 11:30am – 12:00pm: Group Photo, Enquiries, Networking, End. Everyone! With or without prior knowledge to IoT. NORDIN RAMLI received B.Eng degree in electrical engineering from Keio University, Japan in 1999. He received the M.Eng and Ph.D degrees, both in electronic engineering from The University of Electro-Communications, Japan in 2005 and 2008, respectively. Previously, he was at Telekom Malaysia Berhad as a network engineer from 1999-2008, and lecturer at Multimedia University, Malaysia from 2008-2009. Currently, he is a Senior Staff Researcher at Wireless Network & Protocol Research (WNPR), MIMOS Berhad, Malaysia. His current research and development (R&D) interests include cognitive radio, TV white space, space-time processing, equalization, adaptive array system and wireless mesh networking, internet of things (IoTs) and big data. At the meantime, he is a solution architect for the IoTs and big data’s related project. Based on his work, he has published over 80 journals and conference papers, and filed more than 30 patents related to wireless communications which are pending at World Intellectual Property Organization (WIPO) and Intellectual Property Corporation of Malaysia (MyIPO). Currently, Dr Nordin Ramli also serves as an Associate Editor for the Journal IEICE Communication Express (CoMEX) from June 2014 until now. He also has been appointed as the member in the Young Scientist Network of Malaysia Academy of Science, from 2014. He is also a registered professional engineer with Board of Engineer, Malaysia.